Toledo.com/Thrive Internet Marketing recently launched its very first CrowdTilt campaign in support of Streetspun Yarnbombing. If that sentence doesn't compute, let me back up. 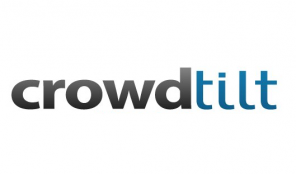 CrowdTilt is a crowdfunding startup. It allows friends, family and community members to support various initiatives or organizations by contributing to their efforts and helping to create a community push that makes financial goals more attainable. An organizer describes in detail the item or cause they hope to fund, and asks for their friends (and sometimes even strangers) to contribute with whatever denomination they feel comfortable with. Contributors can choose to donate anything from $1 to $5,000 or however much the project costs. The organizer can also set the campaign's run dates, so if you need to fund a project in one week, two weeks, three weeks, or a month, you can choose the parameters that best fit your needs. If the CrowdTilt campaign "tilts," the money will be transferred from every contributor's credit or debit card and into the bank account of the organizer or agency receiving the funds. CrowdTilt is similar to Kickstarter, but does not require the organizer to offer incentives or gifts (though you can offer gifts if you want). Additionally, a CrowdTilt campaign does not require a video, and organizers do not have to seek approval for their gift or cause. Essentially, a CrowdTilt campaign can be set up in less than a day. Toledo.com identified a worthy community cause that we thought our fans and followers could appreciate: Streetspun Yarnboming's Yarn Fund. Streetspun is an anonymous street artist who crochets beautiful pieces of art for bike racks, lamp posts, parking meters, street signs, etc. across the Toledo landscape. The works are bright and colorful, and almost seem to keep their attached structures a little warmer, especially in these chilly months of winter. In fact, yarnbombing is an international craze, and cities across the world have embraced their own rising street artists. You can even spot some of Toledo's yarnbombs in other cities (and non-Toledo yarnbombs here), thanks to Streetspun's yarnbomb exchange. The staff at Toledo.com/Thrive IM truly appreciates Streetspun's efforts, who has created some 200 yarnbombs for the streets. However, Streetspun has created all of these yarnbombs on their own dime. We reached out to Streetspun via Facebook and asked how much is spent on materials (a.k.a. yarn) each week. $20 was the reply. And to fund Streetspun's efforts for duration of 2013, we'd need to raise $1000. To ensure that Streetspun received the money, we decided to run the campaign for three weeks, and set the goal at $500. We also encouraged Streetspun to offer incentives to anyone who donated $50 or more to the cause, and decided that at the end of the campaign, we would select three contributors at random to win personal yarnbomb gifts for their generosity. We didn't know what to expect, and it took all of us by surprise when we reached this goal within 24 hours. Oh, the powers of social media! Not only did Toledo.com promote the campaign to our 21,000+ Facebook fans and 3,000+ Twitter followers, but Streetspun reached out through their social circles as well. We also shared the campaign on Toledo.com for our 200,000 unique monthly visitors to find. Combined, we managed to seek out fellow yarnbomb enthusiasts to share the CrowdTilt and make contributions. With almost a full three weeks left, we encouraged our fans and personal friends to donate, even though the initial goal had been met. After all, we were still $500 shy of the actual amount needed to fund Streetspun for a full year. This proved to be a little more difficult since that sense of urgency had dissipated. With a little persistence and some effective "call to action" messaging, we surpassed the goal within hours of ending the campaign. The final amount raised for Streetspun Yarnbombing's Yarn Fund: $1,105. That money was donated amongst 37 contributors, some of them friends of Toledo.com, some of them friends of Streetspun, and some of them complete strangers. Because of these contributors, Toledo will be a more vibrant and warmer city this year. Our first CrowdTilt campaign was a huge success, and exceeded Streetspun and our own expectations. Not only did we meet our goal and then some, but we were able to utilize the Toledo.com brand, demonstrating once again how much we care about the surrounding community. We can't wait to launch additional campaigns in support of worthwhile Toledo causes. If your business is looking for a simple, frugal way to give back to the community, consider organizing a CrowdTilt campaign.